Pirate Phonics 1: Kids Learn to Read teaches children the letter - sound correspondences that are essential in reading and writing. Developed with the same pirate theme as the other apps developed by Unit11, the app offers early lessons, wrapped in a fun package, which are important because will develop phonological skills that are necessary for blending and identifying sounds. Educators and parents need to know that in the ‘Settings’ section they can turn the sounds effects on or off, unlock the islands or reset the game. There is also an ‘Info’ section where you’ll see advertised the second app released by the developer with another 31 new phonics. Our recommendation for the developer is to always include a form of parental control to sections that can take the children out of the app. Going to ‘Extras’ on the start screen will take them to a section that allows users to learn words related to individual phonics with an option to show or hide the phonic. If you don’t want your kid to be distracted while learning this is the best feature for that purpose. But we believe kids learn quicker and their level of interest is higher if they’re having a bit of fun while learning new things. And this is where Pirate Phonics 1 excels by packing the content in a fun story-game about pirates. Children are told in the beginning that a treasure has been stolen by the pirate captain named Blackbeard and his crew while the two kids characters were sleeping. Your mission is to embark on an adventure and unlock all the clues in order to get the treasure back. There are 5 islands: Bone, Cave, Ridgeback, SwordFish and Ghost. Each is focusing on different phonics spread as a route map across the respective islands. Kids will have to pass all the challenges set by the pirates in BlackBeards’s gang to unlock new clues. The app is very elaborate in the sense that it has so many small challenges for each phonic sound. The developer says the app ‘has been designed to support the first stages of phonic learning over an extended period’ and we couldn’t agree more. Even though the attention of young learners is short Pirate Phonics 1 has a lot going for it and kids won’t get bored - this is an app that kids will return to because of the numerous different challenges. The narrator’s voice is clear and the sounds produced are accurate. The background’s sound theme of seagulls on seashore is pleasing and did not interfere when the narrator was sounding out the letters or words. The recordings will help to get across the correct sounds and can be easily accessed at all times by tapping on the ‘ear’ button on the top right corner on each challenge screen. So once you tap on a letter you are asked to answer some questions that will prepare you for the final challenge. Each phonic sound is emphasised through the use of several ‘picture words’ which are deliberately read slowly by the narrator. The small games following were really fun and kids will love playing them. Our favourite challenges that asked you to identify the phonic sound were: tapping the crab, dragging different objects containing the phonic sound or to complete a word, matching cards showing the same phonic, tap the correct phonic in a line up to move the ship ahead of other ships and tap the fire button of a canon to shoot the ships with the correct phonic. The app was very responsive at all times during the review and looks beautiful on the iPad. 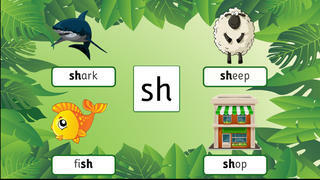 Children will use each island’s map to navigate from one phonic to another. For each challenge they pass they’ll receive coins and progress forward - eventually finding the treasure chest. Once a level has been unlocked children will be able to revisit the island and a specific phonic at any time. We would have liked to see a score for each level in order to compare results but this feature is not available at the moment – it could be something that the developer might consider. Also allowing multiple profiles will be an added benefit as educators or parents will be able to see individual progress. One other concern is that if kids do really badly on the tests for a phonic sound they will still progress to the next one - a score is shown at the end with how many correct, wrong and missed answers the child managed to solve. It is sometimes common with apps for young kids in order to encourage them, but as we said above, not being able to check the previous scores proves tricky to understand on what areas kids need a bit more attention. The app is extensive in its content and for £1.49 is a great buy. The whole app introduces more than 300 words and is targeted at pre-readers. Kids engage in repetition through games and this is a very effective strategy for memorising and retaining the sounds more easily. 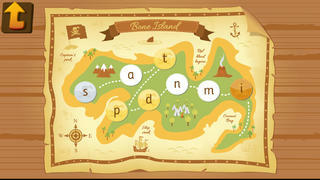 Pirate Phonics offers fun and Phonics for kids who are just learning to read/recognise letters and simple CVC words. Pirate phonics uses the concept of a child’s dream about pirates as the theme of an educational game to develop skills in the basic phonics. It is a very large App which uses 5 ‘treasure islands’ with a ‘phonic’ route map across each island to recover the treasure stolen by Blackbeard the pirate. 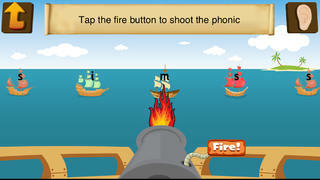 Each phonic is introduced by a pirate with ‘phonic challenges’. By passing the challenges coins are collected and the child heads towards where Blackbeard has hidden the treasure. Each island is completed when the children use phonic challenges to open the treasure chest, but of course that’s not the end! 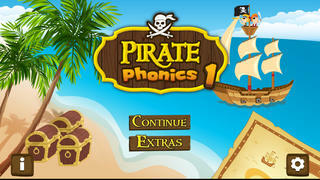 Pirate Phonics 2 is available now!